Leading Manufacturer of profinish-npf, profinish-svn, sylast-cl, sylast-dsws, sylast-gl-conc and sylast-hmt from Navi Mumbai. Wet waxing and softening agent For the finishing of yarns made of synthetic fibers, wool and blends of these; also suitable for cellulosic fibers. Low concentrations give extremely smooth yarns. High yield from long liquors. Good abrasion resistance & antistatic properties. "Thermostable, non-sublimating sewability improver with an excellent soft handle; does not cause thermo migration; no influence on whiteness"
Weakly cationic conditioning agent to improve the sliding properties of bleached or dyed yarns of all types of fiber. A ready-to-use, fully-formulated, new generation polysiloxane based product, designed for application as sewing thread finish. Wet waxing agent for yarns. Excellent low friction on CO yarn, even distribution over the bobbin cross section. Hot melt lubricant for all kind of sewing threads & embroidery yarns. Application temperature 60-80ºC, good handling / pourable. 100% active blend of silicone, waxes & additives. Excellent sewing performance. Lubricant for all kind of sewing threads & embroidery yarns. Excellent sewing performances, good antistatic properties, high exhaustion rate, minimum waste of water-maximum economy. 100% active, 100-125 cps viscosity lubricant based on silicone & additives. 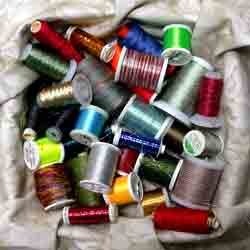 Suitable for all kind of sewing threads & embroidery yarns. For the cold lick roll application. Levelling agent for the high-temperature dyeing of polyester fibres with disperse dyes. It has a synchronizing action on the exhaustion of disperse dye combinations in the heating-up phase & is therefore recommended as an auxiliary for HT rapid-dyeing processes. 100% active, 200-250 cps viscosity lubricant based on silicone & additives. 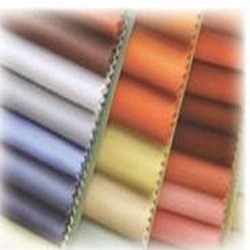 Suitable for all kind of sewing threads & embroidery yarns. For the cold lick roll application. Is developed as a combination of softeners & smoothing agents. Its range of application extends from top back-washing or dyeing machine to yarn & piece good finishing. It reduces fiber-to-fiber & fiber-to-metal friction. Avoid sewing damage to tailored goods. Softener for re-beaming of indigo dyed yarns. It improves the running properties when used as a finish for tops, weaving yarns & embroidery yarns. Is developed as a specialty product for exhaust application as yarn lubrication. Sylast BA confers to the knitting yarns the gliding properties required for further processing. The product is applied in a fresh bath after bleaching or dyeing of the yarns. A softener that improves the tear strength of textile goods of all types of fibers. Key application areas: resin finishing and sewability improver. Softening agent to improve sewability. For cellulosic's, wool and blends of these fibers with synthetics. Improves sewability, especially of open-end yarns. Improves the elasticity of knitted fabrics. Extremely smooth, silky handle. Suitable for jet application. Low foaming. 100% active lubricant based on silicone, waxes & additives. Suitable for all kind of sewing threads & embroidery yarns. For the cold lick roll application. 40% active cationic dispersion of waxes & softeners. Lubricant for 100% cotton sewing threads. Lubricant free of silicone. Moth proofing agent for wool, cellulosic, synthetics & blends. A proprietary blend of waxes & specialty modified fatty amide derivatives that has been specially designed to give good lubrication and soft handle on yarns. Cationic sew ability improver for textile fabrics of cellulosic, synthetic or wool fibers and their blends.